The UFC produced a barnburner of a card last weekend, compensating the Calgary fans for a less than stellar first offering back in 2012. Main evented by the grudge match between Eddie Alvarez and Dustin Poirier, the event featured two former champions getting back in the win column after two tough losses to young up and comers. Both by familiar methods, Joanna Jedrzejczyk cruised to a unanimous decision win over Tecia Torres, followed by Jose Aldo performing an involuntary major procedure on Jeremy Stephens’ liver. These were mere re-calibrations for former champions, unsure of where they must go next, unlike the headlining clash. Dustin Poirier exorcised his Philadelphian demons and finished Eddie Alvarez in the second round. Logically, this should have a major impact on the trajectory of the lightweight division, but will it? Probably not. Before UFC 223 in April, I wrote this piece (link) with the understanding that we were about to see the lightweights ducks finally put in a row. Then the Khabib/Tony curse woke up from hibernation and wreaked havoc on fight week. Nurmagomedov ended up fighting Al Iaquinta for the belt, becoming the single most disputed undisputed champion in history. The McGregor/Khabib/Ferguson love triangle remains intact. …Being Tony I guess. Khabib insists that Tony must come back and beat someone else before he is allowed to share an Octagon with “The Eagle”, and the UFC will likely procrastinate like a fourteen-year-old with his maths homework when it comes to sending out those accursed bout agreements anyway. So we have a timeline: Khabib fights Conor; Tony has a successful comeback from injury and gets the winner. Simple, only, what about Dustin Poirier? Him and Eddie was supposed to be a critical matchup in the continuity of the division, but it only dumps more mud in the water. There is of course, a spot for “The Diamond” in this cast, and if I may assert my puerile and prosaic opinion, it’s not fair. Where does Dustin Poirier fit in? As things stand, there’s no way anyone gets a shot at Khabib’s belt before Conor. The UFC will move heaven and earth to make that fight, and so they should. It’s a big money showdown, with a compelling story that needs an end. Ferguson needs to be reintroduced into the narrative at some point, so he requires a dance partner. Dustin Poirer does not deserve to be that dance partner. Currently on a three fight finish streak over a former WSOF champion and two former UFC champions; in any other division it would be impossible to deny him title contention. But after a stalled linearity, he broke through right when everything was restarting and will not be afforded the opportunity that, in mine and many others’ opinions, he is owed. We all want a round robin of McGregor, Khabib and Tony. If you don’t want it, guess what, you do in fact want it. For the sake of that, Ferguson’s successful comeback should be a mere formality, but then where does that leave Poirier? To sit out for a year waiting for the love triangle to break open? That’s not going to happen, and unfortunately, we will surely see him and Tony this year. A booking conundrum, and not one that I can divine, but man, what a shame. In any other circumstances this fight is dynamite. Right now both men deserve their shot, but only one can get it. 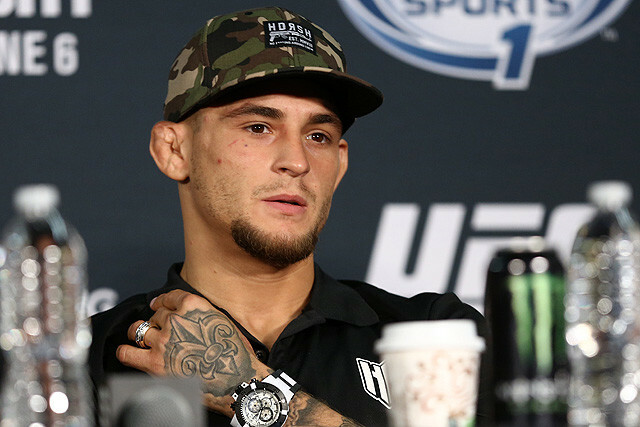 Maybe Poirier pulls off what would certainly be the upset and beats Ferguson. If he doesn’t, then that will leave him on the side-lines as collateral damage. This sport is ruthless sometimes. Images courtesy of combatpress.com and mmaweekly.com.